The Roman baths in the city of Bath were not just any old thermal springs. Restoration has revealed just how special they were. After a visit, try the magical waters yourself in the 21st-century spa. Bathhouses were common places to socialize all over the Roman World. But the bath center dedicated to the goddess Sulis Minerva in the English city of Bath, now a UNESCO World Heritage Site, was unique. Nowhere else in the Roman Empire has such a large and complex arrangement of baths, treatment rooms and shrines ever been discovered, all of it heated naturally in - for the Romans anyway - a completely mysterious way. It pours out of the ground at more than a million liters a day, every day, and has done so reliably, pretty much forever (in terms of the human history of the area at least). The water gushing out of the springs (and there are at least three separate springs in Bath), probably fell as rain on the surrounding hills long before the Romans even existed, 10,000 years ago. For the Romans, it was miraculous. And, even with our modern scientific knowledge of geology, aquifers, earth's temperatures and the like, the phenomenon is still pretty amazing. Hot mineral water spews forth at a reliable 13 liters per second. And excavations suggest human activity around the spring as long ago as 8,000 years. Watch a video of the main Roman overflow. Well into the 1990s, a visit to the Roman Baths in the UNESCO World Heritage city of Bath, was through a dank, semi-dark set of ruins, poorly explained and, frankly, to the uninitiated, a little bit boring. The idea of these 2000 year old Roman baths, only discovered in the mid 19th century and opened to the public in the late 1800s, was more exciting than the experience. Up until 1978, people occasionally swam in the algae tinted, green waters of the Great Bath and some of the smaller baths were used for therapeutic treatments. But the cost of upkeep and the discovery of a dangerous bacteria in the old pipe works led to the baths being declared off limits. All that has changed. In 1997, after many initiatives came and went, an injection of Heritage Lottery Fund money led to a massive revival. A new public facility, the multi-million pound spa complex, Thermae Bath Spa, opened in 2006. And the Roman baths, known as the King's Bath, reopened to the public with vastly improved museum exhibits and multimedia presentations. see how the baths were built and maintained. chat with a "Roman" on a bench beside the Great Bath. Hot tip: Visit the Roman baths in the morning, as your first outing of the day. There is a lot to take in and you don't want to spoil your enjoyment by waiting until later in the day when you may have aching feet and be jaded by sightseeing. Open: The baths are open every day except Christmas and Boxing Day, from about 9 or 9:30am to 4:30 or 5pm depending upon the season. July and August hours are extended with last admission at 9p.m. and last exit at 10p.m. After a morning exploring the Roman Baths and sightseeing up and down the hills of Bath, what better way to soothe aching muscles and unkink than with a visit to a spa. Bath's Thermae Bath Spa, with the promise of total immersion in the city's amazing, naturally hot mineral waters, could be just the thing. The Roman spring continues to feed hot water at 46ºC (about 115º F) at a rate of 1,170.000 liters (257,364 gallons) per day into the baths but now it's diverted through clean new pipes into sparkling new facilities. The temperature is also modified with the addition of cold water, so you don't have to worry about being boiled like a lobster. And, because this is a public facility, a session in the naturally hot waters can be remarkably affordable. The spa spreads across two Georgian buildings, wrapping parts of the early Bath stone structures in expanses of modern aqua tinted glass. The New Royal Bath, the larger of the two buildings contains the main pools, changing rooms, steam rooms, rain showers, treatment rooms and a café. The Cross Bath, in a Grade I Listed, Robert Adam-style building is the location of one of the city's three original springs and has a fascinating history of its own. More of that later. Entry to the Royal Bath is in two-hour, four-hour or all day sessions. There are a variety of other packages, including a twilight package that includes dinner in the café. At the front desk visitors are given an aqua colored rubber wristband, with some embedded electronics, that operates the entrance turnstiles as well as the lockers. Slippers, towels and robes can be rented. Sessions can include massages and therapies but if you do book treatments, the time they take is considered part of your session. The Thermae Bath Spa is a municipal facility operated by the local council. Considerations of energy saving, cost control and health and safety are probably more of a factor than the sybaritic luxury of a private spa. So steam in the steam rooms may not be as hot and steamy as you might expect and the promised variety of scents in the different steam chambers may be relatively undetectable. Special features such as rain showers or hydrotherapy bubbles in the pools operate on timed cycles which seem more "Off" than "On" . Some of the pools - particularly the indoor Minerva Bath - can get pretty crowded. None of this is necessarily a bad thing. In fact, if you think about it, the Roman Baths were also community facilities and were probably crowded too. So it's an authentic and enjoyable experience, as long as you manage your expectations. The highlight of the visit will no doubt be the rooftop pool. If the weather is cold, it's a bit of a dash to get in and out of the hot water. But once you are bobbing about in Britain's only natural hot springs, the spires of Bath Abbey and the hills that surround the city glimpsed through clouds of steam, the effect is magical. In winter, when it gets dark as early as 3:30p.m. in England, you can book a twilight session and watch the stars come out while you swim. If you are looking for a quieter experience, you could luxuriate in The Cross Bath, across the street from the main facility. This small bath is in a Grade I listed building. It was rebuilt in the 1790s, but it has been around a good deal longer and may be on the site of the original pre Roman sacred spring. It is mentioned in very early 16th century literature. In the 17th century, Mary of Modena,second wife of King James II, took to the waters of the Cross Bath, on doctor's advice, to conceive a child. She succeeded in conceiving a son, though some contemporary stories suggest that it may not have been the waters - at the time the Cross Bath had a somewhat unsavory reputation. On the other hand, the rumors were probably part of a campaign of anti-Catholic propaganda and innuendo. Shortly after his son was born, the Catholic James II was sent packing and a Dutch Protestant, William of Orange was invited to reign. Today, The Cross Bath offers a serene experience. The small, intimate bath can only accommodate a few people at a time. Sessions are shorter - 1 1/2 hours rather than 2 - and the price slightly higher, but if you'd enjoy a peaceful soak, open to the sky but otherwise relatively private, this is the bath to try. There are changing facilities for up to 12 people and you can book the Cross Bath for a private event. Given its history, maybe a baby shower would be appropriate. While there, dip your toe into the waters of the specially commissioned, modern fountain at the head of the modern pool. It's the only place in Bath where you can feel the hot water of the spring, undiluted with cooler water, straight out of the ground. Don't worry - if you've ever washed dishes by hand, you can take it. The Romans subscribed to the concept of salus per aquam - health through water. In fact, some people believe that the word "spa" originates from the initials for that phrase. They used the extensive facilities at Bath to socialize, improve their health, engage in spiritual activities and meditate. 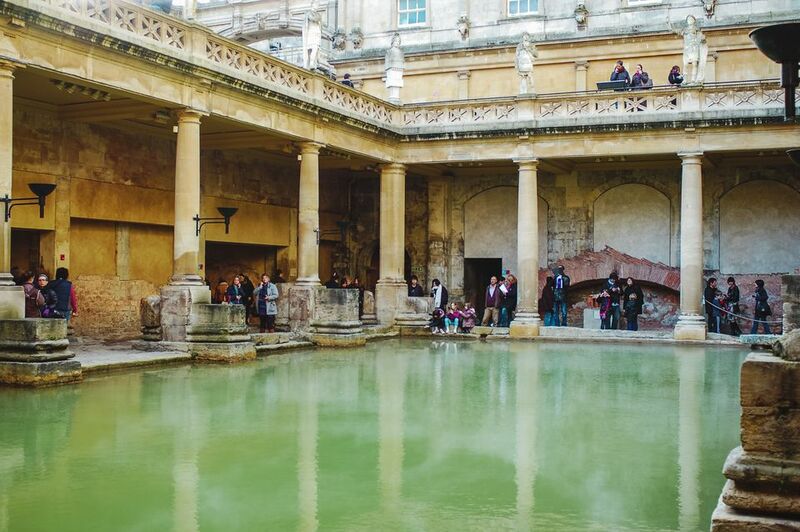 You can try the formula yourself by following a visit to the Roman Baths with a few hours luxuriating in the natural hot spring water at the new Thermae Bath Spa. To sample the experience, book the Spas Ancient & Modern package. At £81.50 per person (in 2017) for a weekday lunch or afternoon tea package (£84.50 for weekends) it may seem expensive but it includes a ticket to the Roman Baths, a two hour session at the modern spa and either a three course set lunch or a champagne tea in the Pump Room Book it through the Bath Tourist Information Center. A variety of spa packages and treatments are available every day except Christmas, Boxing Day and New Year's Day.. Most sessions and treatments, except for sessions in the Cross Bath, can be booked in advance on 01225 33 1234 or, from overseas, +44 (0) 1225 33 1234. For more information about current schedules, packages and prices, visit their website. When you go, stop for a moment and think about what a special experience bathing in the UK's only natural hot spring is. You will be reaching back into history to share an experience with people who lived, gossiped, negotiated business deals and played in these waters thousands of years ago.